With a background in high-level (human) nursing and education, Karen is passionate about helping people and their dogs learn together and develop a bond based on a mutual understanding of one another. 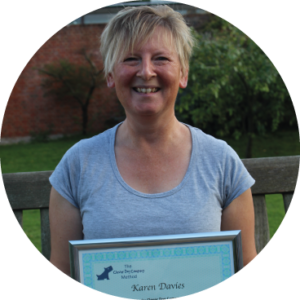 As well as being a Clever Dog Company Method trainer, Karen is also a qualified canine behaviourist, a Bach Flower Remedy Animal Practitioner, and soon to be Tellington Touch Companion Animal Practitioner. If that wasn’t enough, Karen is obsessed with dogs’ body language and communication, and admits to spending hours observing dogs and puppies so she can pass on her vital learning to owners so they can recognise the vital signs that their dogs are communicating. With a particular fascination for puppies, senior dogs and dogs with anxiety or nervousness, Karen is a true friend to dogs and a real help to their owners.